K-12 schools are bringing drag queens into the classroom to teach gender ideology, a Thursday video revealed. 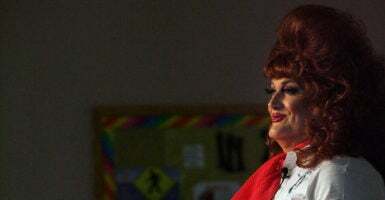 Maurice Sendak Community School, a public school located in Brooklyn, New York, hosted a drag queen and first grade teacher Alexis Hernandez marveled at the event in a testimonial published on Drag Queen Story Hour’s website. The first grade teacher said she would be hosting the event again the following year. Katrina Green, a teacher from Chickpeas Preschool in Brooklyn, also lauded the program. The event “allows preschool children to deepen and complicate their ideas about gender at the exact age when they are often developing rigid ideas about this concept,” Green said. Fitzgerald cited articles noting a spike in children identifying as transgender within the past few years. Fitzgerald directed viewers to stopk12indoctrination.org, where they can report indoctrination in K-12 schools.